If you can see this - the Forum is back online. See the article below for more information. I am extremely pleased to say that most of the data from the forum has been recovered and it has proved possible, by an extremely devious route, to get that data inserted into a new database. I am sorry about this. When we go live, if you should have difficulty logging in, it may be that you are one of the 8. Should this be so, please re-register. If you then email me (at the address at the bottom of this page) I will TRY to recover your former status and any missing posts. I would also re-iterate my thanks to Bruce of Web Wiz who was also instrumental in helping to achive this. Thankyou everyone for your patience. I hope that the time (and money!) spent on this exercise will prevent such problems in the future and make the forum an even more enjoyable facility to use. In desperation I paid the forum software developer to try to repair the corrupt database. Unfortunately, he was unable to do so, finding that the database had been totally corrupted. In all fairness to him, he then refunded the money - so ..... if you read this, thank you Bruce of Web Wiz! I still anticipate being able to give read only access to the content of this forum but it will take sometime as I am going to have to write all the code myself. In the meantime, I am continuing to test software for the new forum and will get it up and running as soon as practicable. Please be patient - none of this is easy! Over the last few days considerable effort has been put into trying to restore the forum. It has become obvious that this is going to be a lengthy and arduous process as the underlying database is badly corrupted. Even when it is restored, this will not solve the problems which caused the corruption in the first place. As a result of this, and incompatability with the proposed more robust structure, we are, as I mentioned previously, going to have to open a new forum for you. This itself, will take a few days to design and build and, unfortunately, will mean that most of you will have to register on the new forum. over the next few days a new forum will be built and you will be invited to register on it. It will include all the features you are used to .. .and a few more besides! over a longer period the previous forum will be rebuilt and become accessible but ONLY to view - it will be closed to both registration AND new posts. Recently, the forum has been the subject of a number of attacks by spammers and, even more seriously, sad individuals whose only pleasure in life appears to be to destroy others. Some of you will have read of some of the problems in the forum recently. As an example, our "real" membership numbers nearly 2,000 individuals. But, in recent weeks, this has swollen to in excess of 20,000 individuals. I have been wresting with these problems but attacks were being carried through with such persistence that it reached the point where even many of the administration functions were no longer working. It is valid to say that this is, in part, "our" fault, as the software we are using is seriously overburdened - but, replacing it with something more appropriate is either a mammoth task or prohibitively expensive - or both! The end result of these attacks is that earlier today the forum finally fell over completely. All is not lost as we do have all of the data backed up but, again, actually getting the forum up and running is likely to be a huge task. It is likely that we will be forced to start a brand new forum and work on restoring the data over a period of time. Please return here for reports on progress being made and, please, if we do have to start from scratch, continue to give your valuable support to the UK's longest standing and best forum for discussing our native herps. RAUK has received a review copy of this forthcoming book (publication September 2010). Although South-East Asia hardly qualifies as the UK, this could well prove of interest to those of our members planning a holiday or field trip to the region. This is an extremely comprehensive guide to the reptiles of this area. 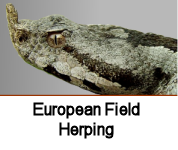 The author is a well-experienced and qualified herpetologist with an excellent knowledge of the animals in the region. The book opens with a brief (relatively) introduction to reptiles and the region. In typical field guide style this is followed by the illustrations. These are paintings of the animals and nearly 700 species are illustrated in 74 coloured plates. The standard of the illustrations is extremely high. If I were to search for weaknesses in these there are one or two instances where the exact shape of an animal's head is not captured - but this is a difficult area for any artist. Inevitably, of course, it is also impossible to capture all the potential colour variations, especially in such families as the Agamids where colour changes can be quite pronounced. Nevertheless, these minor factors are not so pronounced as to preclude identification, especially when taken with the brief species descriptions accompanying each plate. The latter part of the book - nearly 200 pages - is devoted largely to more detailed descriptions of each species and includes their habitat, behaviour and, of course, their geographical distribution. There is a comprehensive index of both English and taxonomic names. 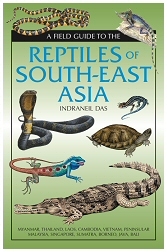 The book claims to cover all of the species in the region (Thailand, Myanmar, Laos, Vietnam, Cambodia, Singapore, Peninsular Malaya and the Greater Sundas) . If it were not for the speed with which animals are being re-classified and new species being discovered I would say this claim is well justified. Probably the only problem with this book as a field guide is its sheer size - some 375 pages. Nevertheless it should prove invaluable to those visiting the region. Thoroughly recommended for those planning a trip to the area or just interested in the reptiles of the region. The Whitsun Bank Holiday weekend saw the launch of Amphibian and Reptile Conservation's "Sliding Scales" campaign. On their website they say "Snakes are as central to our natural history and as prominent in folklore as the water vole, badger or barn owl. Yet, unlike these species, snakes are maligned by many people. There is a general lack of awareness of the conservation needs of these species amongst landowners and members of the wider community. Persecution events still occur even though this practice is illegal. But the extent and significance of this is still largely unknown." The purpose of this campaign is to raise the profile of these beautiful creatures, improve an understanding of them and their needs amongst the general public. Click on the campaign logo above for more information.